How do you launch a new grocery concept on the most dreaded day of the year? Bfresh, a grocery store opening its first area store in Boston's Allston neighborhood, came to us with a challenge – to generate social buzz for the brand and drive awareness of the new store. It just so happened that bfresh was opening on the most dreaded weekend in Allston – move-in day – where the population balloons by 124%, abandoned furniture and debris crowd the streets, traffic clogs narrow neighborhood routes, and everybody starts feeling a little less neighborly. 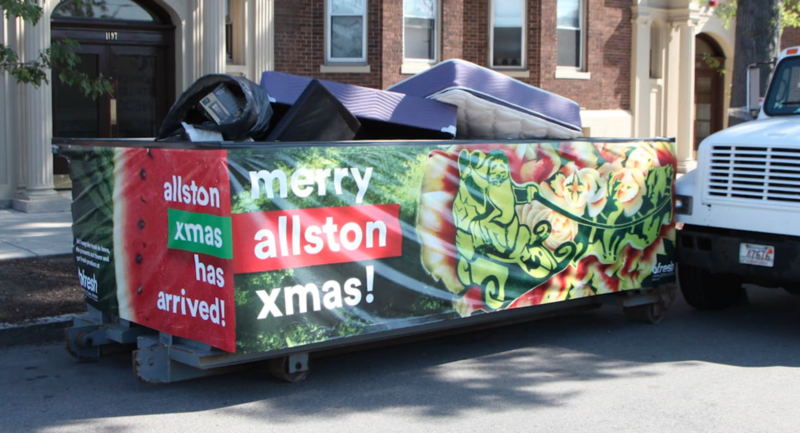 To ensure we left a fresh impression on the neighborhood – and to stand out from the moving melodrama – we devised a strategy to celebrate Allston Christmas and translate the fresh and vibrant personality of the brand into the experience. For starters, we placed colorful Xmas dumpsters in areas that we knew would have high turnover, so departing residents had a place for their debris and the movers could leave their “presents” in a fresh way. Hipster Santas and elves gifted fresh fruit and frozen fruit popsicles in the sweltering heat to make moves smoother, carolers spread good cheer with Allston Xmas-themed carols throughout the neighborhood, and a public “Allston Xmas tree” made of fresh fruit added to the festive spirit. Santa- and reindeer-operated pedicabs wove through the congested streets to provide refreshments to weary movers. Through social listening and a partnership with a neighboring realtor, we surprised new residents with “Very Merry Allston Xmas” gifts – including prepaid MiFis for Internet service during the inevitable wait for the cable guy. And on “Xmas” morning we lined the streets with stockings filled with fresh snacks – even giving some to T commuters for a fresh start to their day.